The texture on this alternathera is fabulous. This row of containers at Indianapolis Museum of Art show how strong an element can be presented by repeating identical containers in a display. Day 326 – WHAT A DAY!! Classics are hard to beat. These containers with white, silver and green foliage are classic pieces that stand the test of time, especially with the gray stone bird feature added to the mix. White begonia, carex grass, dicondra, and some other viney thing that I can’t recognize. Today was a classic good day. I got to speak to a group at the Garden Writer’s Symposium about something I love: annual flowers. I won an Ipad2 at their award ceremony. One of my heroes, Judy Lowe, gave me an autographed copy of her latest book “Herbs!”. And several of my favorite garden bloggers mentioned my blog in THEIR talk– which was going on during my talk. Lots of good things – I’m thankful! Containers seen on gwa 2011 tour today. Exhausted and going to bed now – will fill you in on plants later. One of my favorite container ideas that I saw today at Garden Writers Symposium in Indianapolis was the miniature garden shoppe. 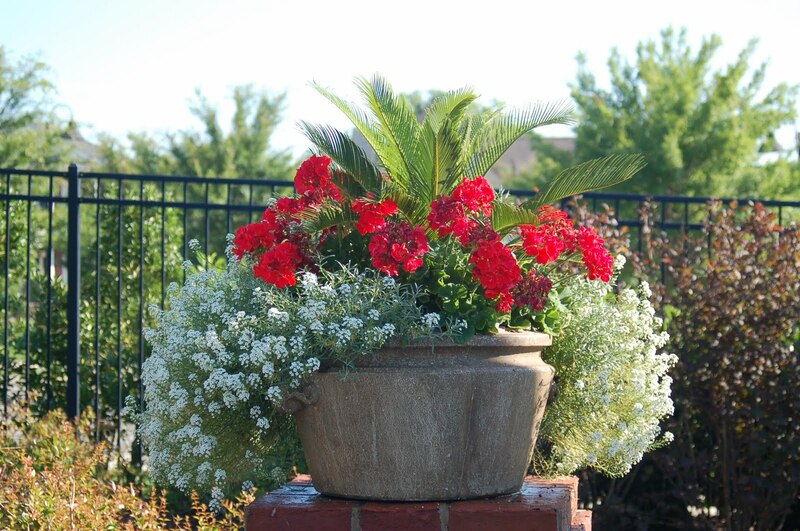 Great plants, adorable scenes, portable plantings. So what does this title have to do with today’s blogpost? Well, I’m in Indianapolis at a writer’s workshop that I’ve been in all afternoon, I have this blogpost to write, I went out to dinner with a group of fellow attendees, and now I have a homework assignment to write for tomorrow’s class. So I’m trying out my excuses just in case I fall asleep while writing and don’t get it finished. So enjoy this combo of Hula Girl Hibiscus, Patriot Weeper Lantana, Red verbena, and red ivy geraniums while I hold the dogs back and write to my homework assignment. Are y’all having as much fun as I am with this year of container gardening ideas? This basket of Pennisetum ‘Molly’, Sedum ‘Lemon Ball’, and Mandevilla ‘Sun Parasol Crimson’ turned out to be one of my favorites this year. Tibouchina lepidota) to be covered in blooms. The verbena and calibrachoa along the container have almost petered out, the coleus and sweet potato vine are plugging along, but this Tibuchina has hardly flowered until now. But I’m thinking it might just be worth the wait. I’ve grown the Princess Flower Tibouchina urvilleana in the past and had more blooms throughout the summer, but never have I had this full a display. Both these plants seem to do best in consistently moist soil.